In this paper, we investigate the effect of vertical throughflow on the onset of convection in a horizontal layer of a non-Darcy porous medium saturated with a nanofluid. A normal mode analysis is used to find solutions for the fluid layer confined between parallel plates with free-rigid boundaries. The criterion for the onset of stationary and oscillatory convection is derived. The analysis incorporates the effects of Brownian motion, thermophoresis and a convective boundary condition. The effects of the concentration Rayleigh number, Lewis number, Darcy number and modified diffusivity ratio on the stability of the system are investigated. In the last several years, an innovative technique for improving the heat transfer characteristics by adding ultra fine metallic particles in common fluids such as water and oil has been investigated. The term nanofluid refers to these kinds of fluids which have applications in automotive industries, energy saving devices, nuclear rectors, etc., Choi . Nanoparticles also have medical applications including cancer therapy and nano-drug delivery (Shaw and Murthy ). Buongiorno  noted that the absolute velocity of nanoparticles can be viewed as the sum of the base fluid velocity and a relative (slip) velocity. He concluded that in the absence of turbulence, Brownian diffusion and thermophoresis would be important. A lot of work has been done on nanofluids; see, for instance, Nadeem et al. , Malik et al. , Nadeem et al. and the review by Das et al. . The effect of a magnetic field on flow and heat transfer problems is important in industrial applications, such as in the buoyant upward gas-liquid flow in packed bed electrodes (Takahashi and Alkire ), sodium oxide-silicon dioxide glass melt flows (Guloyan ), reactive polymer flows in heterogeneous porous media , electrochemical generation of elemental bromine in porous electrode systems (Qi and Savinell ). The convective boundary condition is more general and realistic in engineering and industrial processes such as transportation cooling processes, material drying, etc. It therefore seems appropriate to use the convective boundary condition to study other boundary layer flow situations. Aziz  studied the Blasius flow over a flat plate with a convection thermal boundary condition. Ishak  investigated the effects of suction and injection on a flat surface with convective boundary condition. The study of the boundary layer flows over flat surfaces under convective surface boundary condition has attracted the attention of many researchers, such as Makinde and Aziz , Yao et al. .
Nanofluids have great potential as coolants due to their enhanced thermal conductivities. The enhancement of effective thermal conductivity was confirmed by experiments conducted by many researchers (Masuda et al. ). Instability of nanofluids in natural convection was studied by Tzou . Tzou  studied thermal instability of nanofluids in natural convection. Thermal instability in nanofluids in a porous medium has been a topic of interest due to potential applications of such flows in food and chemical processes, petroleum industry, bio-mechanics and geophysical problems. Buongiorno’s model was applied to the problem of the onset of instability in a porous medium layer saturated with a nanofluid by Nield and Kuznetsov [19, 20]. Kuznetsov and Nield  used the Brinkman model to study thermal instability in a horizontal porous layer saturated with a nanofluid. Other related studies of thermal instability in a porous medium saturated with a nanofluid include those by Kuznetsov and Nield  and Nield and Kuznetsov [23–26]. In this study, we extend the work by Nield and Kuznetsov  to a non-Darcy porous medium saturated with a nanofluid. We have considered a convective boundary condition in place of an isothermal condition. The effect of the Biot number, magnetic parameter, Brinkman-Darcy parameter on thermal instability has been studied. where v = ( u , v , w ) is the velocity vector, ρ is the density of the fluid, t is the time, p is the hydraulic pressure, ϕ is the volume fraction of nanoparticles, ρ p is the density of nanoparticles, β is the coefficient of thermal expansion, μ ˜ is effective viscosity, μ is viscosity and σ m is electric conductivity. In the energy equation, ( ρ c ) m is the heat capacity of the fluid in the porous medium, ( ρ c ) p is the heat capacity of nanoparticles and k m is thermal conductivity. In the equation of continuity for nanoparticles, D B is the Brownian diffusion coefficient, given by the Einstein-Stokes equation and D T is the thermophoretic diffusion coefficient of nanoparticles. w ( 0 ) = V , ϕ ( 0 ) = ϕ 0 , w ( H ) = V and ϕ ( H ) = ϕ 1 . 1 σ ∂ ϕ ∂ t + 1 ϵ v ⋅ ∇ ϕ = 1 Le ∇ 2 ϕ + N A Le ∇ 2 T .
w = Q , ∂ T ∂ z = − Bi ( 1 − T ) , ϕ = 0 at z = 0 , w = Q , T = 0 , ϕ = 1 at z = 0 . Pr = μ / ρ κ , Da = K / H 2 , Va = ϵ Pr Da , Rm = ρ p ϕ 0 + ρ ( 1 − ϕ 0 ) g H μ κ , Ra = ρ g α H ( T 0 − T 1 ) μ κ , Rn = ( ρ p − ρ ) ( ϕ 1 − ϕ 0 ) g H μ κ , Da ˜ = μ ˜ K μ H 2 , M = σ m B 0 2 κ μ , Le = κ D B , N A = D T ( T 0 − T 1 ) D B T 1 ( ϕ 1 − ϕ 0 ) , N B = ( ρ c ) p ( ϕ 1 − ϕ 0 ) ( ρ c ) f , Q = H V α m , Bi = h f H k m .
We note here that the parameter Rm is a measure of the basic static pressure gradient. v = v b ≡ ( 0 , 0 , Q ) , T = T b ( z ) , ϕ = ϕ b ( z ) . d 2 ϕ b d z 2 + N A d 2 T b d z 2 = 0 . T b = Bi 1 + Bi ( 1 − z ) , ϕ b = z .
the same results were obtained by Nield and Kuznetsov . v = v b + v ′ , p = p b + p ′ , T = T b + T ′ , ϕ = ϕ b + ϕ ′ . w ′ = 0 , ∂ T ′ ∂ z = B i T ′ , ϕ ′ = 0 at z = 0 , w ′ = 0 , T ′ = 0 , ϕ ′ = 0 at z = 1 .
d ϕ b d z = λ e λ z e λ − 1 ( 1 − δ ( e Q − 1 ) Q ( Q − λ ) ) − δ Q Q − λ e Q z . 1 Va ∂ ∂ t ∇ 2 w ′ − Da ˜ ∇ 4 w ′ + ( 1 + M ) ∇ 2 w ′ = Ra ∇ H 2 T ′ + Rn ∇ H 2 ϕ ′ . W = 0 , ∂ Θ ∂ z = Bi Θ , Φ = 0 at z = 0 , W = 0 , Θ = 0 , Φ = 0 at z = 1 . W = ∑ p = 1 N A p W p , Θ = ∑ p = 1 N B p Θ p , Φ = ∑ p = 1 N C p Φ p .
W = 0 , D 2 W = 0 , Θ = 0 , Φ = 0 at z = 0 , W = 0 , D 2 W = 0 , Θ = 0 , Φ = 0 at z = 1 . J T W = ∫ 0 1 d T b d z W d z = Bi Q 4 ( Q − Bi ( 1 − e Q ) ) [ 6 Q 2 + 30 Q + 48 − e Q ( Q 3 − 18 Q + 48 ) ] , J Φ Θ = ∫ 0 1 d ϕ b d z D Θ d z = − δ Q 2 ( Q − λ ) [ 2 Q + 6 − e Q ( Q 2 − 4 Q + 6 ) ] J Φ Θ = + 1 λ 2 ( e λ − 1 ) ( 1 + δ ( e Q − 1 ) Q − λ ) [ 2 λ + 6 − e λ ( λ 2 − 4 λ + 6 ) ] , J T Θ = ∫ 0 1 d T b d z Θ d z = − Bi Q 2 ( Q − Bi ( 1 − e Q ) ) [ 2 Q + 6 − e Q ( Q 2 − 4 Q + 6 ) ] , J T Φ = ∫ 0 1 d T b d z Φ d z = Bi Q 2 ( Q − Bi ( 1 − e Q ) ) [ Q + 2 + e Q ( Q − 2 ) ] , J Φ W = ∫ 0 1 d ϕ b d z D W d z = δ Q 4 ( Q − λ ) [ 6 Q 2 + 30 Q + 48 − e Q ( Q 3 − 16 Q + 48 ) ] J Φ W = − 1 λ 4 ( e λ − 1 ) ( 1 + δ ( e Q − 1 ) Q − λ ) [ 6 λ 2 + 30 λ + 48 − e λ ( λ 3 − 16 λ + 48 ) ] . For the non-trivial solution, the determinant of the augmented matrix is equal to zero, s is a dimensionless growth factor. We put s = i ω , where ω is real and is the dimensionless frequency. Ra s − Rn [ Rn N A Le J 2 J T W + J ϕ W ε A 1 A 2 ] = ( 1 + M + 36 5 Da ˜ ) [ J Le A 1 − N A Le J 2 N B Le J T ϕ ] α 2 12 A 2 . A 1 = N B Le J ϕ θ + 2 N A N B Le J T θ − J 2 , A 2 = J Le J T W + 1 ε N B Le J T ϕ J ϕ W .
( ∂ Ra ∂ α ) α = α c = 0 .
a 1 = − 1 18 J T W Le ( 1 + M + 36 5 Da ˜ ) [ 2 Le A 1 − N A Le J 2 N B Le J T ϕ ] , a 2 = − A 2 6 ( 2 J T W Le + J ϕ W ε N B Le J T ϕ ) ( 1 + M + 36 5 Da ˜ ) [ 2 Le A 1 − N A Le J 2 N B Le J T ϕ ] , a 3 = − A 2 432 ( 2 J T W Le + J ϕ W ε N B Le J T ϕ ) [ 1 Le ( 1 + M + 36 5 Da ˜ ) + Rn ( N A Le J T W − J ϕ W ε ) ] a 3 = − 1 432 J T W Le [ 2 Le A 1 − N A Le J 2 N B Le J T ϕ ] . We calculate the corresponding critical Rayleigh number ( Ra s ) crit using the above critical value of α for stationary convection. 0 = Ra − Rn [ 6 ε J T W σ J ϕ W ] − 1 Va α 2 J T W ω 2 − 12 σ Va α 2 J T w [ J Le A 1 − N A N B Le J 2 J T ϕ ] 0 = + 12 σ α 2 J T w ( 1 + M + 36 5 Da ˜ ) [ − J 12 Le + 1 σ A 1 ] . Ra − Rn [ σ J ϕ W 6 ε J T W ] ≥ 12 σ Va α 2 J T w [ J Le A 1 − N A N B Le J 2 J T ϕ ] + 12 σ α 2 J T w ( 1 + M + 36 5 Da ˜ ) [ − J 12 Le + 1 σ A 1 ] . ω 2 = σ J T W A 2 [ α 2 J ϕ W 72 ε Rn + J Va Le A 1 − N a N V J 2 Va Le 2 J T ϕ + ( 1 + M + 36 5 Da ˜ ) ( − J 12 Le + 1 σ A 1 ) ] 1 Va ( − J 12 Le + 1 σ A 1 ) − 1 12 σ ( 1 + M + 36 5 Da ˜ ) + 1 12 Va J T W A 2 .
α c 4 | osc = − 72 Le × [ ( A 1 − N A Le N B Le J T ϕ ) + Va ( 1 + M + 36 5 Da ˜ ) ( − 1 6 Le + 1 σ A 1 ) + ω 2 6 σ ] . The critical Rayleigh number ( Ra osc ) crit is obtained using the above critical value of α for oscillatory convection. The critical Rayleigh numbers for stationary and oscillatory convection are calculated from equations (40) and (46), respectively. The influence of the Biot number, magnetic parameter, Darcy number, porosity of the medium on the stationary Rayleigh number and oscillatory Rayleigh number are shown in Figures 1-6, where we have also shown the critical stationary and oscillatory Rayleigh numbers for different Darcy and Biot numbers. In the present problem, we mainly focused on the influence of Biot number on stationary and oscillatory critical Rayleigh numbers. Variation of the stationary Rayleigh number with wave number for different value of (a) Bi , M ( Da = 1 , ε = 0.7 ) and (b) Da , ε ( Bi = 1 , M = 2 ) with Va = 0.3 , Rn = − 3 , N B = 10 , Le = 500 , N A = 5 , σ = 3 . The effects of the Biot number, magnetic parameter, Darcy number and porosity on the stationary Rayleigh number are shown in Figure 1, where it is evident that Ra s increases with the magnetic parameter but decreases with the Biot number. Hence the magnetic parameter exerts a stabilizing influence on the stationary convection regime, but Biot number destabilizes stationary convection. The Darcy number has a stabilizing effect on stationary convection, while the porosity parameter has a destabilizing influence on the stationary convection for fixed Biot numbers. This finding is in line with the results reported by Chand and Rana . 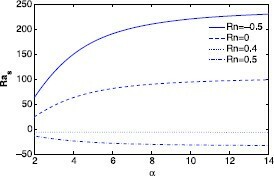 Figure 2 shows the influence of the modified diffusivity ratio λ, the modified particle-density increment and the Lewis number on the stationary Rayleigh number. The stationary Rayleigh number increases with N A , N B and the Lewis number, and this helps to stabilize the stationary convection regime. On the other hand, λ destabilizes stationary convection. Thus, in the absence of the Darcy-Brinkman and magnetic parameters, the stability boundary depends on N B and N A as earlier suggested by Nield and Kuznetsov . The throughflow (due to Peclet number Q) also assists in increasing the critical stationary Rayleigh number. Variation of the stationary Rayleigh number with wave number for different value of (a) λ , N A ( N B = 10 , Le = 500 ) and (b) N B , Le ( λ = 2 , N A = 5 ) with Va = 0.3 , Rn = − 3 , Da = 1 , M = 2 , ε = 0.7 , N B = 10 , Le = 500 , N A = 5 , σ = 3 , Bi = 1 . The influence of the Biot number, magnetic parameter, Peclet number and Vadasz number on the oscillatory Rayleigh number is shown in Figure 3. The critical oscillatory Rayleigh number increases with the magnetic parameter while decreasing with parameters Bi, Va and Q. Hence the magnetic parameter stabilizes the oscillatory convection, while the other parameters are destabilizing to the oscillatory regime. Variation of the oscillatory Rayleigh number with wave number for different value of (a) Bi , M ( Q = 1 , Va = 0.3 ) and (b) Q , Va ( Bi = 1 , M = 2 ) with Rn = − 3 , Da = 1 , N B = 10 , Le = 500 , N A = 5 , σ = 3 . The critical stationary and oscillatory Rayleigh number as a function of the Darcy number is shown in Figure 4. The critical stationary Rayleigh number decreases with the Biot number. For Da = 0 , the critical Rayleigh number has a minimum value that depends on the Biot number as shown in Figure 5. For larger Biot numbers (isothermal condition), the critical Rayleigh number is small. The critical value of Ra s is 64.9325, 44.4513 and 42.3685 for Bi = 1 , 10 and 100 , respectively. The critical Ra osc values, on the other hand, are 562.3439, 286.1277 and 258.3124 for Bi = 1 , 10 and 100 , respectively. Influence of the Biot number on (a) ( Ra s ) crit and (b) ( Ra osc ) crit as a function of Da with Va = 0.3 , Rn = − 3 , M = 2 , N B = 10 , Le = 500 , N A = 5 , σ = 3 , ε = 0.7 . Effect of the Biot number on critical α s as a function of Da with Va = 0.3 , Rn = − 3 , M = 2 , N B = 10 , Le = 500 , N A = 5 , σ = 3 , ε = 0.7 . We have defined Rn so that it is positive when the particle density increases upwards (the destabilizing situation). From Figure 6, we note that Ra takes a negative value when Rn is sufficiently large. In this case, the destabilizing effect of nanoparticle concentration is so large that the bottom of the fluid layer must be cooled relative to the top to produce a state of neutral stability as earlier found by Kuznetsov and Nield  in the absence of a magnetic field and higher Biot numbers. In the present problem, a state of neutral stability appeared when Rn = 0.4 . In this study we used linear stability to investigate the onset of thermal instability in a non-Darcy porous medium saturated with a nanofluid, and with a convective boundary condition. We have determined the effects of various embedded parameters such as the Biot number, the magnetic parameter and the Darcy number on the critical Rayleigh number for the onset of both oscillatory and stationary thermal instabilities. 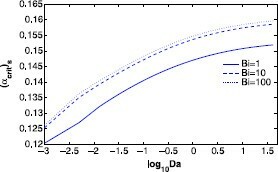 We have shown that increasing the Darcy number and the magnetic parameter has the effect of increasing the critical Rayleigh number for the onset of thermal instabilities in the case of stationary convection, while increasing the Biot number and the porosity is destabilizing to the stationary regime. The modified diffusivity ratio, particle density increment and the Lewis number help to stabilize stationary convection. Oscillatory convection was found not to be as sensitive to the fluid and physical parameters as stationary convection. All the authors were involved in carrying out this study.